One of my favorite activities to do before Christmas break was making gingerbread houses in the classroom. I did a Gingerbread unit for a few weeks and we would finish the unit by having a pajama party and making gingerbread houses. During the week, I collected milk cartons from the students at lunch. To prepare the milk cartons, I washed and dried them, then stapled the top shut. If your school doesn’t have milk cartons anymore, I’ve heard some teachers use these craft milk cartons instead. The day of, I laid out TONS of candy, icing, and graham crackers. 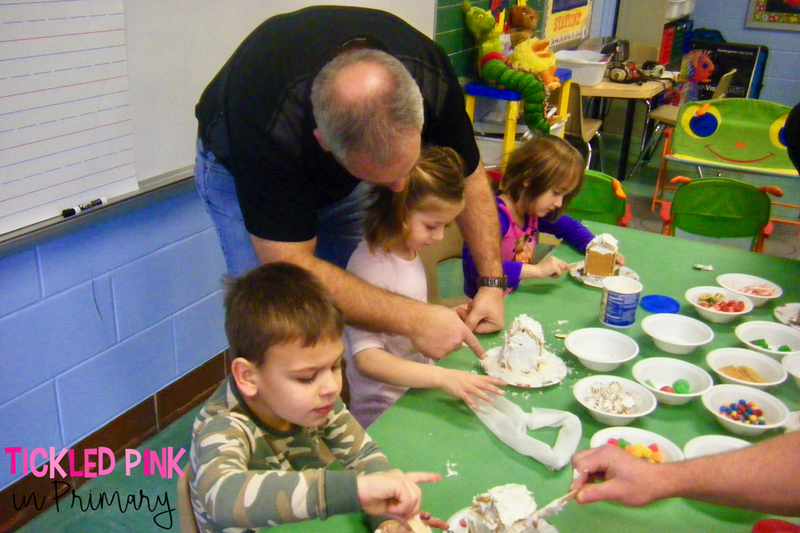 Then, I showed the students how to use the icing like glue so everything would stick. They used jumbo popsicle sticks as knives. Don’t forget to remind students NOT to lick the popsicle sticks! 🙂 Making gingerbread houses in the classroom is much easier if you have parent volunteers! Thankfully, I got so many parents that came in to help for this project. If they couldn’t attend, many were willing to donate the items needed for these houses. It was fun to see the creativity of each student. They definitely tried to fit as much candy as possible onto their houses. Here are the finished Gingerbread houses! We did this project in the morning, so they have plenty of time to dry and harden up before they go home. Once finished, we do a writing prompt about our Gingerbread houses. You can grab this FREE gingerbread writing prompt by clicking the picture below. There are 2 different writing pages with dotted lines and without. I have more Gingerbread activities which you can read more about in my Activities for 6 Winter Books post. It includes the Gingerbread Man, the Gingerbread Girl, the Gingerbread Baby, and more! There are affiliate links in this post to help you find materials I’ve used easily. Read my disclosure statement to learn more.